Tesla’s approach to the automobile is a reimagining. The company’s Model S has a boot at the back and another at the front. The motor is electric and it can send 270 kilowatts of power to the rear wheels. There is no petrol engine. This is not a hybrid. It is an all electric car capable of matching a V8 on power and without any of the pollution. Electric vehicles aren’t new, but the commercial availability of an electric family sedan in Australia is a recent phenomenon. The problem hampering their adoption has to do with the batteries that power them as they struggle on range and take a long while to charge. This was my apprehension with Tesla’s Model S. I wondered if it was ready for a country weak on electric car infrastructure, or if it would be crippled by neglected support. People who buy a Tesla get a specialty charger installed in their homes that replenishes the car’s battery in six hours. A ‘mobile connector’ makes it possible to replenish some charge anywhere else in roughly ten hours. I was given neither. Instead, I had to rely on Tesla’s ‘superchargers’. These are public charging stations that will replenish the car’s 85kW battery in an hour at no cost. Only two locations in Sydney have superchargers at the moment and one of them is the Tesla dealership in St Leonards. The other is The Star casino in Sydney and it is where our road trip starts; a real world test to determine if an all electric car will provide the same sense of freedom as one running on petrol. The time was 9:02am when the Model S’ charge had reached 98 per cent. The on board computer calculated the typical range to be 389 kilometres. The plan was to drive to Berry, a small town south of Sydney, stop for shenanigans, and then return. This would constitute little more than four hours of driving and cover an estimated 288 kilometres. The car’s remaining hundred kilometres would be discharged on the way home and on return to the St Leonards dealership the coming day. I cannot say all went to plan. We headed off, three guys and myself, all fascinated by Tesla’s take on the car. Its GPS system estimated we would arrive at Berry with 69 per cent battery remaining. Nothing was left to do other than wind the windows down and take in the surroundings. The car cruised quietly and inconspicuously throughout the streets of Sydney. There is no engine noise, no quivering motor, no exhaust note. The loudest part of a Model S is the methodical sound of an engaged blinker. More expensive cars strive for this level of quiet and fall short. The lack of sound is matched by its ride comfort. The air suspension — a $2500 option fitted to our review car — makes it possible to adjust the ride height of the Model S. The car can stand tall to overcome potholes at slow speeds or squat close to the tarmac to improve aerodynamics. No matter the setting, the Model S will iron out the dips and bumps for a ride as comfortable as it is silent. Interior quality is another matter. A toggle tucked into the sides of the front seats can increase or decrease lumbar support. I sat in the driver’s seat for hours on end feeling as though it was in fact correcting my posture. Warranting criticism is the quality of the leather upholstery, which cannot best that of similarly priced European rivals. 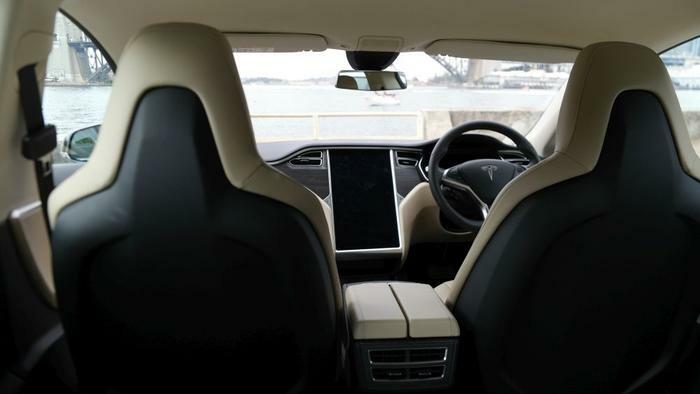 One does not buy a Model S for its leather. People gravitate to the marque for the way it uses technology to make driving simpler. Only two buttons can be found on the dashboard, with the rest of the controls virtualised and managed from a screen 17-inches large. A secondary screen replaces the dials typically found in the instrument panel. The two displays provide contextual insights on the car’s battery and performance. Driving the car at night left me wanting to turn off the large display as its brightness would creep into my field of view. The Model S can perform software updates. I hope an option to deactivate the screen — so that it works like a tablet — is in the pipelines. It wasn't long before I encountered my first problem. Before we left, the car estimated we would arrive with 69 per cent of charge remaining. And yet that’s how much we had in reserve at the half-way mark. I had been driving the Model S like a petrol car, with an overtake here and a tap of the throttle there. The car revised its projection and estimated I would arrive at Berry with only 49 per cent of charge. I would have to drive conservatively if I had a chance at skipping another recharge at The Star come nightfall. Or worse yet: find myself stranded by the side of some road and no way to make it back. 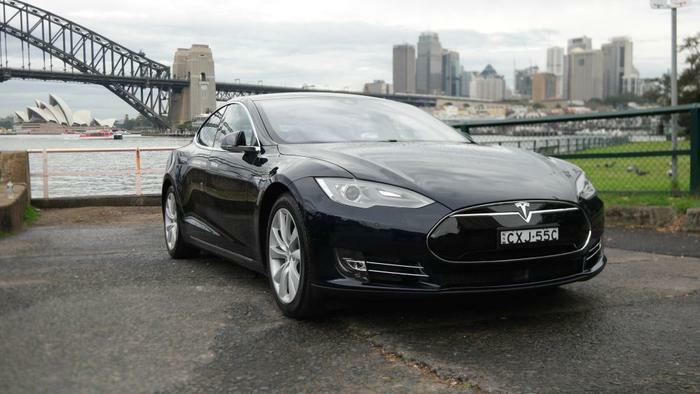 Driving the Tesla like any petrol-powered car came easy. 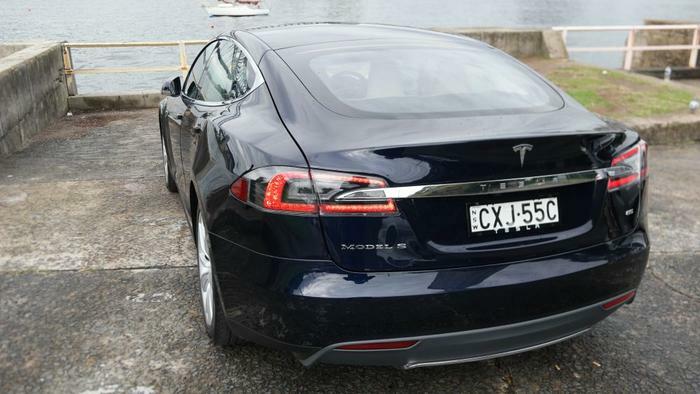 The Model S 85 I commandeered could reach 100 kilometres per hour in 5.4 seconds. This is territory occupied by V8 powered cars, such as Holden’s SS Commodore. There is a distinct difference to the way it accelerates. Ordinary engines experience a drop in power between gear changes. The Tesla does not because it has one gear and its torque is at a constant maximum. Passengers sink into their seats if the throttle is fully engaged without warning. It would be savage were it not for the lack of noise, the comfort of the interior and the consistency of its power. Rather, it builds up speed with grace, soaring forwards with near-perfect form. Having one gear can be disappointing. Reward can be found in handling a manual gearbox, down-gearing at just the right time as a form of engine braking. Select roads left me longing for an old school manual, even if it was some unimpressive four-cylinder from the year of my birth. This romance can’t be found in the engines powering an electric car. Some consolation can be found in the Tesla’s regenerative braking. Most companies take the power lost when braking and route it to a battery. Tesla’s implementation goes one step further by gleaning power from the moment your foot lifts off the accelerator. A sensation eerily familiar to engine braking kicks in as the Model S begins to slow down. There were times I relied solely on this feature to decelerate because it was fun. Using this feature and coasting on the highways proved valuable. I arrived at Berry ahead of the car's projections with 53 per cent left in the battery. Famished, I parked the car outside the few small shops lining the main road. “Where should we eat?,” I asked my friends. “Somewhere with meat,” was the general consensus. We stepped out of the car to a crowd in awe. I walked away to the site of people pulling phones from pockets and taking photos. The Model S’ looks keep people divided. The front of the car appears dictated by the laws of aerodynamics, with a slanting bonnet and downward facing grille. A low drag coefficient would be on the minds of designers pioneering an electric car. Every other angle complements. It is a blend of subtle lines and soft curves, accented at all the right times by touches of chrome. The mirrors, for instance, sit on exquisite chrome arms. 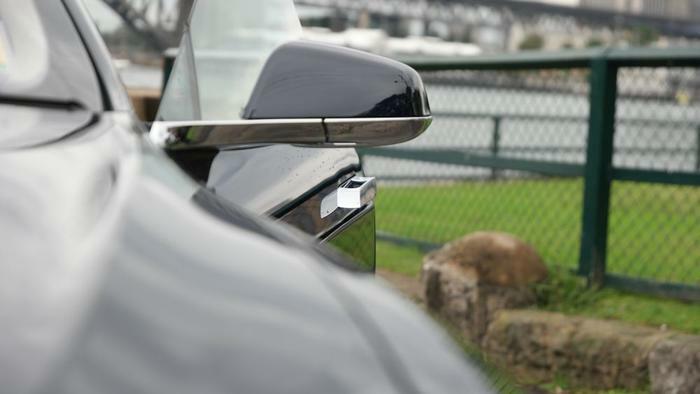 The door handles match in colour and sit flush against the panels when driving. Motion towards the Tesla with the key in your pocket and they slowly emerge in a move evocative of ceremony. The handles serve another purpose. 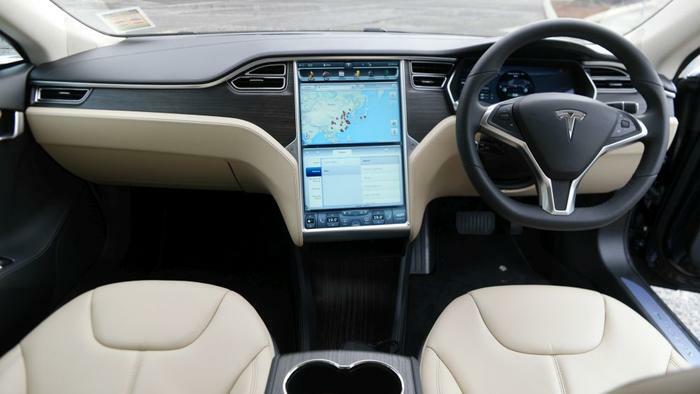 The Model S is full of intelligent features that are hidden beneath its skin. It does some of the thinking for you in an intuitive move that eliminates some of driving’s redundancies. The emerging handles are the only indication the doors are locked or unlocked. This logic is applied throughout the car. It makes do without a handbrake by automatically applying it when it is in park. Starting the car involves no key or buttons; simply tap the brake and you’re good to go. I came to appreciate this car’s foresight during our brief four days together. It is the kind of ingenuity found only by approaching a problem with a fresh take. Just last night I tried to start a Honda by tapping the brakes. The time was 2:30pm when we decided to make our way back home. We shimmied past the crowd and made haste with 53 per cent battery left and a lot of road to cover. I hoped restrained driving would be enough to get us home and to return the Tesla the next day. “Prepare for the worst”, the adage goes. An hour later and the battery was depleting fast. It wasn’t my driving because it matched the car’s projections. Only 24 per cent battery remained and at the same rate we would arrive home with 10 per cent battery. I was not sure that would be enough to avoid another pit stop at a supercharging station. I came to a fork in the road as we were leaving Wollongong and realised I was in the wrong lane. A silver Mercedes van lingered in my blind spot, speeding up to overtake me, speeding up and closing any gap. I couldn’t take the exit and was forced to drive another route 30 kilometres longer. The GPS rerouted. The car revised its estimate. l was cutting it close. The clock struck 4pm and I had made the executive decision to drag my friends with me to The Star casino for a recharge — if we could make it. They reluctantly complied having been tired from the day spent leaving and returning to Sydney. By 4:30pm the car’s battery turned from a sickly green into a cautionary red. Making matters worse was the fact we would be captives of gridlock traffic. A friend of mine began groaning as his Apple iPhone 6 ran out of battery. We sat in the traffic as tensions simmered, making light of the situation with jokes of pushing an expensive car down the city streets. We did this until the traffic eased twenty minutes later. The time was 4:58pm. The battery had 7 per cent (30 kilometres) remaining. 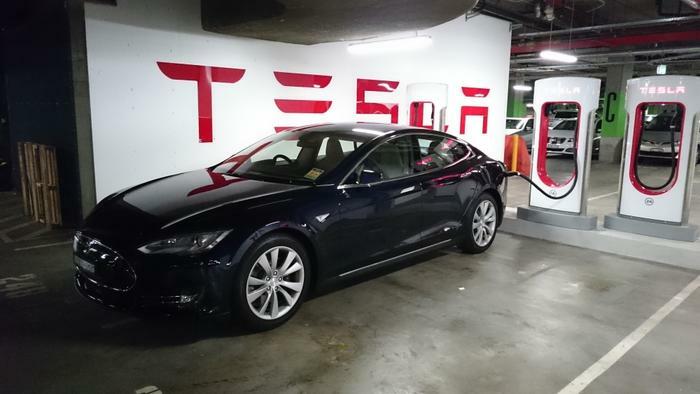 I pulled into The Star casino’s lower level car park to recharge the Tesla Model S.
Charging the car is as easy as recharging a phone. Hovering the charging nozzle over the left rear light automatically opens the charging port. I plugged the charger in and was greeted by convivial Tesla owners, each one generous with their time and spoke about their Tesla’s with zeal. I spent half an hour asking questions on what it is like owning a Tesla, trying to glean an understanding on the daily sacrifices made. Both owners assured me the few gripes were outweighed by the many advantages. They talked about the community of Tesla owners and picked the fine details of my car. “It’s a shame you didn’t get the performance model”, one owner said. 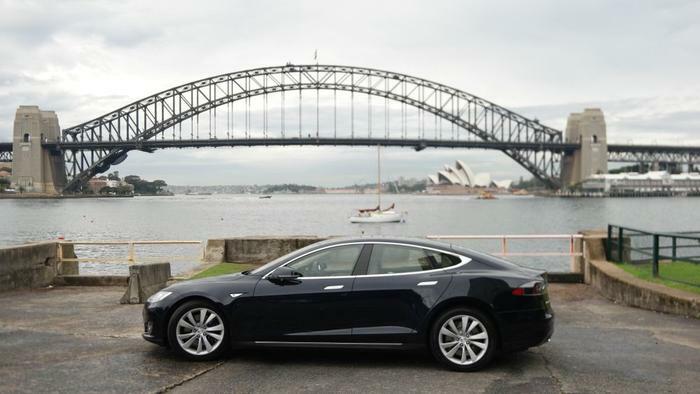 “There’s only two other Tesla’s [in Australia] in this shade of green,” said another. Sixty-two minutes later and the battery of the Model S was full. My friend retrieved his charging iPhone from the hotel concierge and was happy with its 32 per cent of battery. Overnight I mulled the significance of the Tesla Model S. Perhaps the company was right in borrowing the naming convention of Ford’s Model T, the first inexpensive car to be mass produced. There are obvious problems that will have to be overcome in time. The batteries have an 8-year warranty and replacing them thereafter could be costly. This is the only servicing the car needs, besides general upkeep, the likes of tyres, brakes and suspension. The lack of a larger network of superchargers is the other problem. But there was a time when a great thinker proposed putting a petrol station on every corner and the world baulked. Tesla already has a network of superchargers in the United States, throughout Europe and in parts of Asia. There are 439 supercharger stations hosting 2,419 superchargers globally. Australia will get its own network across the east coast — spanning from Brisbane to Melbourne — by 2016. Early adopters are not tethered by this electric car. The Model S still affords them the freedom of mobility, only they are weighed down by a mobile charger until the infrastructure follows. The Model S is pricey — our review car had a drive-away price of $144,615. Making electric cars cheaper is another obstacle that will be overcome with the passing of time. Tesla will release the Model 3 in Australia by 2018, and it will have a price in the ballpark of $US35,000. I drove to the dealership the next morning to return the Tesla. Returning a press car is a matter of handing in the keys and walking away. I pulled in the car park and made sure I reversed the car perfectly. The manager of the local dealership greeted me, and I began talking at length about the Model S.
I shared with him facts he already knew, like the fun had when decelerating, or the way Tesla streamlines parts of the driving experience. Or how the car remembered it was approaching the dealership and it raised its suspension accordingly. I wanted to talk about the Teslas in the showroom, including the rare Roadster that sparked this commercial electric revolution; it doesn’t have floor mounted batteries like the Model S for a low centre of gravity. I wanted to charge the car at designated supercharger stations and make comments on the colour combinations of other cars. I could’ve gone on for hours, days, months and years, wanting to be a Tesla owner.